Coming late February, Powell-Bones will add a purple color to their Team wheels. This Spring, Sure-Grip is adding a new higher end quad speed wheel called the Monza. Although we still have some time before these babies come out, we wanted to let you know about them ahead of time so you can watch for promotions and release dates – you’re welcome. Do you need new Hockey skates? Well, you’re in luck because we have the latest Tour Hockey inline hockey skates in stock now. Visit our website for a full list. 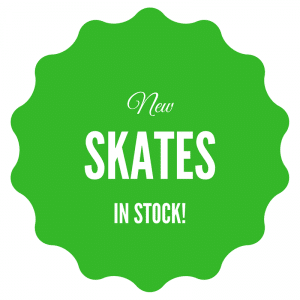 If hockey isn’t your specialty, and instead you’re looking to restock our rink with valuable high-quality roller skates – check out this list of our new shipment! 66TA Code 7 – Tour Force indoor/outdoor wheels, Bevo Silver 5 bearings. The boot has Tuff Skin exterior, memory foam, and thermo-layer construction. Available in sizes 5-13. 64TA Code 5 – Many of the same features as the 66TA skate, but with Tour Flow indoor/outdoor wheels. Available in sizes 5-13. 88TA Code 3 – Labeda Gripper wheels, Bevo Gold 9 bearings. The boot has ARC Tongue, Accu-Aire Ventilation System, and custom surlon structural support. Available in sizes 5-13, with half sizes from 7 ½ to 10 ½.
Don’t wait, never miss another promotion again, and be one of the first to know about our new products and special promotions just by signing up to be a part of our email list! For more information about our products at Southeastern Skate Supply, visit our website or send us an email at info@seskate.com. Are you a current Southeastern Skate Supply customer? Rate and share your experience with us in the review section of our Facebook page today. We always enjoy hearing from you!